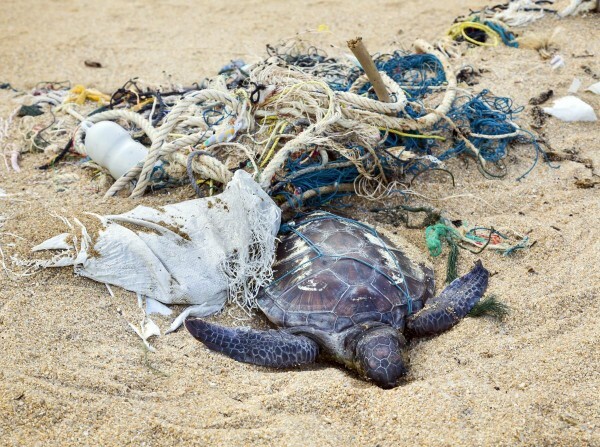 Plastic Pollution in the World’s Oceans: More than 5 Trillion Plastic Pieces weighing over 250,000 Tons Afloat at Sea. Plastic pollution is ubiquitous throughout the marine environment, yet estimates of the global abundance and weight of floating plastics have lacked data, particularly from the Southern Hemisphere and remote regions. Plastic pollution is globally distributed across all oceans due to its properties of buoyancy and durability, and the sorption of toxicants to plastic while traveling through the environment, have led some researchers to claim that synthetic polymers in the ocean should be regarded as hazardous waste. The impact of plastic pollution through ingestion and entanglement of marine fauna, ranging from zooplankton to cetaceans, seabirds and marine reptiles, are well documented.